What occurs to you when you think of a playground? Jungle gym, seesaw, swing, or various games you played with your friends? Many of you must have a memory of getting too excited while playing and forgetting that you needed to go home. Goyang Children’s Museum is happy to present A-Mazing day, Today!, its first special exhibition organized in celebration of the museum’s first anniversary on the theme of 'joy' (playful characteristic) found commonly in games that are important for children’s development and art. A-Mazing day, Today! started from the question of how children experience art — which they encounter for the first time — as joyfully as when they play games, at the museum that they visit for the first time. Children use their five senses as if in play when they face artworks created through the imagination of artists, freely conversing, communicating and empathizing with them and finding the inherent beauty and unique structure, harmony, rules, etc. of each of them based on rational and emotional approaches, transcending restricted interpretation of meanings. As they do that, they will feel the joy of constructing an imaginative world of their own. Accumulation of such artistic experience provides the driving force for children in developing creativity, sensitivity and curiosity. It will also enrich their life and help them to live harmoniously. 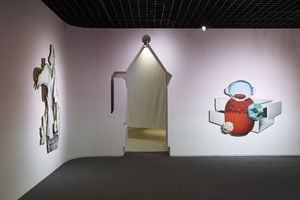 With the special exhibition, Goyang Children’s Museum hopes to offer a basis for children to grow into harmonious and creative adults by experiencing, appreciating, and empathizing with sculptures, photographs, installations, and interactive media art pieces by contemporary artists GWON Osang, AHN Kyuchul and HYBE, as if playing games on playground. 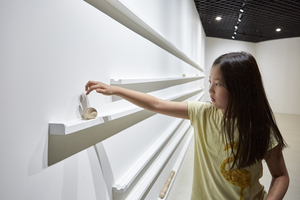 GWON Osang, who explores ways of handling flat images and three-dimensional figures with ‘photo-sculpture’ subverting the conventionality of sculptures by turning photo images into solids, organized the work table to help children’s understanding of space and artworks. In a space full of warm and soft colors, he presents sculptures of various different formats including The Flat, which was created by transforming photo images of daily objects that children can easily find around them into sculptures and taking their photos once again; Relief, a sculpture in the form of flat relief; Mobile, a hanging sculpture, and New Structure, in which two-dimensional images have turned into a huge structure. 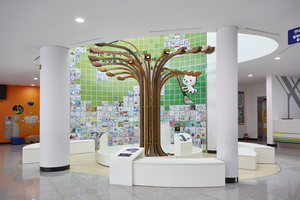 Notably, the 3m high New Structure allows children to experience visual pleasure as they move through the work casually and discover familiar objects changed into artistic images. 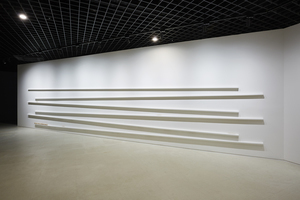 AHN Kyuchul is interested in the spaces and common objects encountered daily by people, their relationship with society, and participation of viewers in artworks. He created Double Helix maze using sheets of thin cloth that pass bright lights based on his childhood memory of playing between sheets of cloth hanging in the backyard, letting viewers move around the maze freely, without following set routes, find themselves and others in the maze, and recognize their relationships. With Lingering Time, he leads viewers to observe the usual passage of time through the work in which balls are set to roll down at a regular speed, delivering the concepts of beginning and end in a natural way. 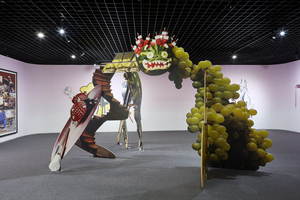 Viewers can feel and observe the works casually, finding fun in interpreting and experiencing them in their own ways, and not sticking to set rules. How did ‘I’ of the past move? HYBE takes interest in the environment surrounding us and offers works that are completed by viewers. 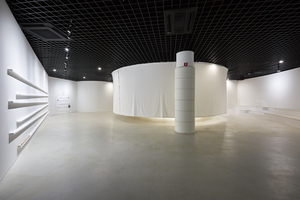 With Moment and Quartet, viewers can be artists and take part in artworks themselves, while observing themselves in the past as if in a time machine and expressing their presence in various ways. In Leaf, the message for the next person becomes a leaf, who in turn, makes it fall down. Viewers can share other people’s memories and get a chance to think about relationships and memories connected with others. By experiencing the work, children will be able to feel the joy of sharing someone else’s memory and getting an insight into the meaning of life. 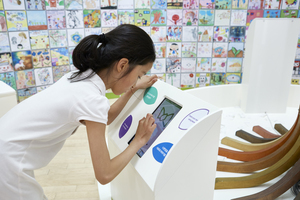 Visit Goyang Children’s Museum and enjoy its special exhibition A-Mazing day, Today! where children and all family members can observe and experience artworks as well as feel the playful characteristic of art, while recognizing art that exist everywhere around us and discovering the meanings and happiness of everyday life. Installation view of A-Mazing Day, Today!